I am still seriously addicted to spinning. I've not had as much opportunity to spin over the last week, as it's been pretty busy. 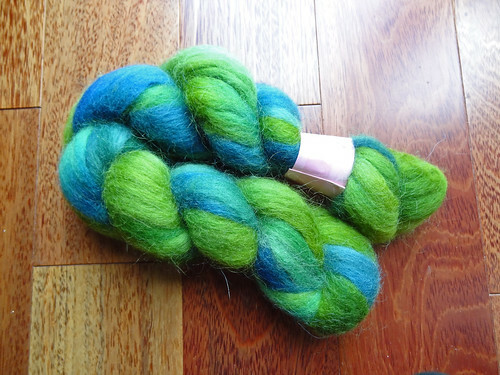 However, I have started working on one braid of my Hilltop Cloud fibre, the Mallard. I mentioned it my latest podcast, but I don't think I've blogged about it. 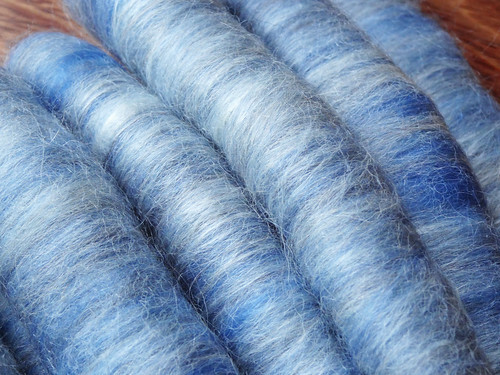 This gorgeously soft fibre is 62% merino/25% BFL/13% baby alpaca. 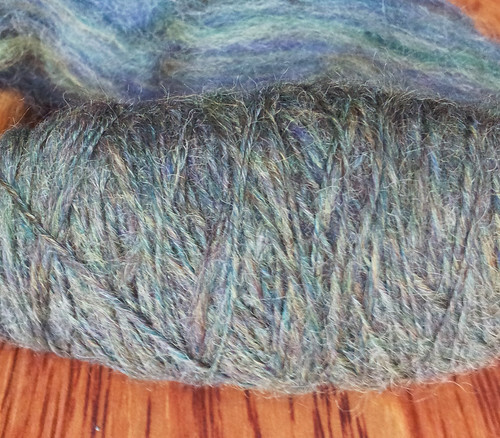 It's very different from the previous fibres I've spun, as the fibre is much smoother. I'm just glad there is some BFL in there to keep it glued together a bit more easily for this beginner spinner. I decided to divide the 100g of fibre into four and spin 25g of singles each time. 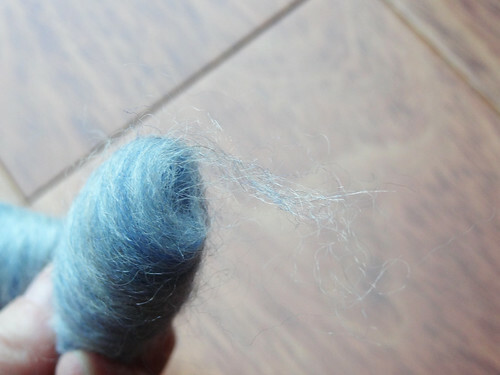 This seemed like a good amount after hearing Jasmine of The Knitmore Girls talk about spinning 1oz at a time and then at the end of the spinning, match up the singles to get the most consistently balanced finished fibre. This also seems a good amount to spin at one time on my Rakestraw. This means I will have two 50g skeins of 2-ply yarn. I love the way this is spinning up. The fibres are very slippery and draft out very easily. 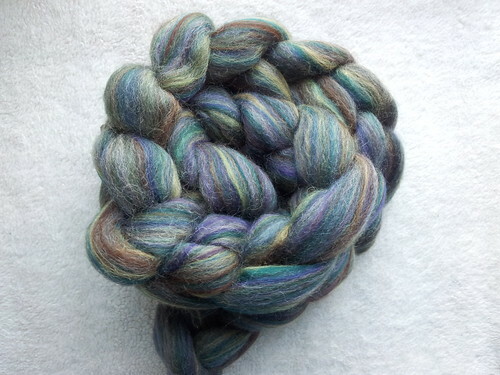 I love how the blend of the colours makes the single such a pretty and heathered colour. This should mean that the finished yarn will be a uniform colourway, but it will have real depth. I'm really looking forward to seeing how it works out. I have recently bought a new app, the iSpinToolkit. The very clever Rachel of the Reecie's Pieces Podcast, told me about it, after my last spinning blog post. I am so grateful as at the very least I will be able to find out what weight my finished yarn is! As I learn more about spinning, I think I will understand more about the functions of this app. To that end I have also got a subscription to Spin-Off Magazine, which is produced by Interweave. I have the latest issue and I'm reading through the really fascinating articles about the history and origins of spinning. I love how the articles are not just "how-tos". There is history and interviews that are filling out my knowledge of spinning, because I really know nothing at the moment. I am not really planning on taking part in the Tour de Fleece 2013, which starts on Saturday, 29th June, but I do want to try and spin every day it is going on. I suppose that means I'm taking part, but I won't join in with any of the teams. I did use a discount from the Tour Discount Thread to get some more fibre. I got some fibre from Fondant Fibre, as they are a UK company. I decided to buy some rolags, as they fascinate me. 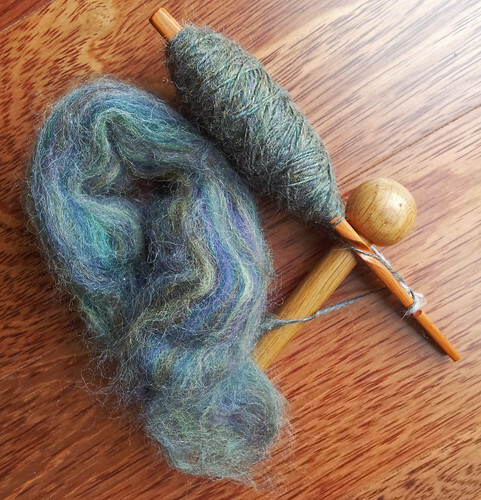 I also think they are the ideal way to try to start spinning a woollen yarn, rather than a worsted one. This article explains the difference. The rolags I got are gorgeous. There are 12 rolags, giving a total weight of 110g and they are made with Blue Faced Leicester, Shetland, Alpaca, Mohair and Silk. They have an amazingly soft sheen and depth of colour and I can't wait to start. These little whisps of fibre at the tip of the rolag, are calling to me to be spun. I think these will be next on the Rakestraw. The other fibre I got from Fondant Fibre, is Icelandic Wool. It's another type of fibre I've not tried before and the colour just called to me. The fibre feels quite coarse and I think it has a long staple length. There is quite a lot of fibre here at 140g, so it should be interesting to get a bit more yarn out of it than the normal 100g. I have no idea what to make out of this fibre. I shall have to think some more. 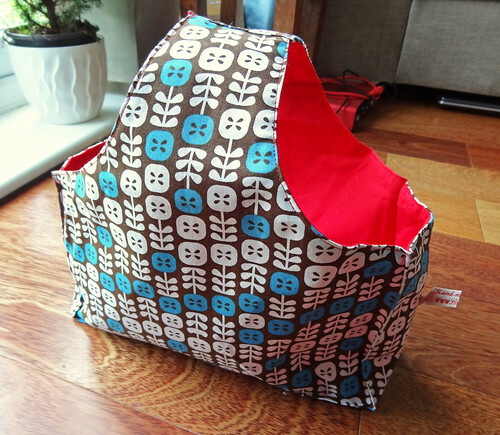 I also decided to buy a bag to use for my spinning. I saw Nic's Knots latest bag design, the Karrie Wrist Bag, and thought it would be ideal. The bag is quite large and hold comfortably both the rolags and the Icelandic Wool. The bag slips over the wrist and is open. I think putting the majority of the fibre, I'm spinning, in this bag will keep it tucked away and protect it from dirt and matting. I'm glad I'm not alone in my new found love for spinning. Sarah from Crafts from the Cwtch also shares my addiction and is doing a regular link up for spinning blog posts. If you are interested, click here.